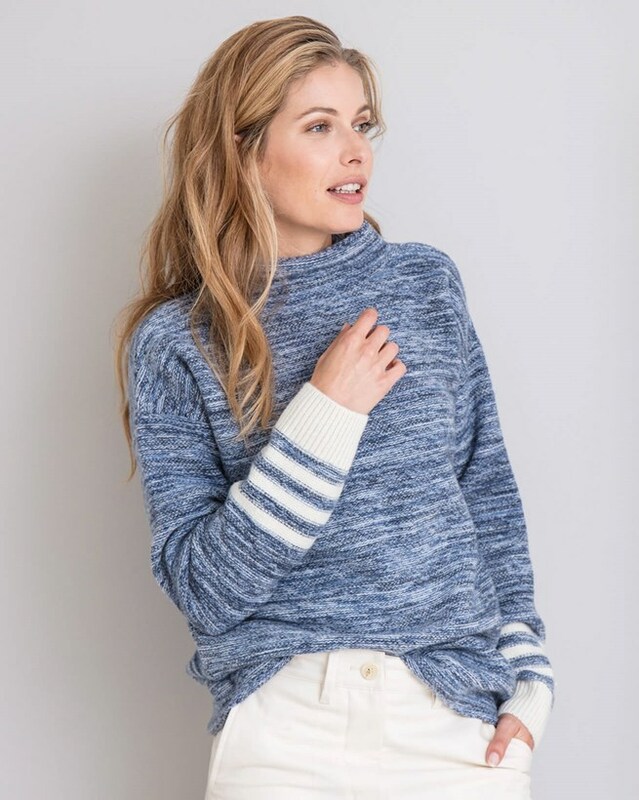 Based on one of our best sellers, the Felted Funnel Neck, and inspired by the colours and textures of our surrounding coastlines, we have developed a new take on a Celtic & Co. classic. 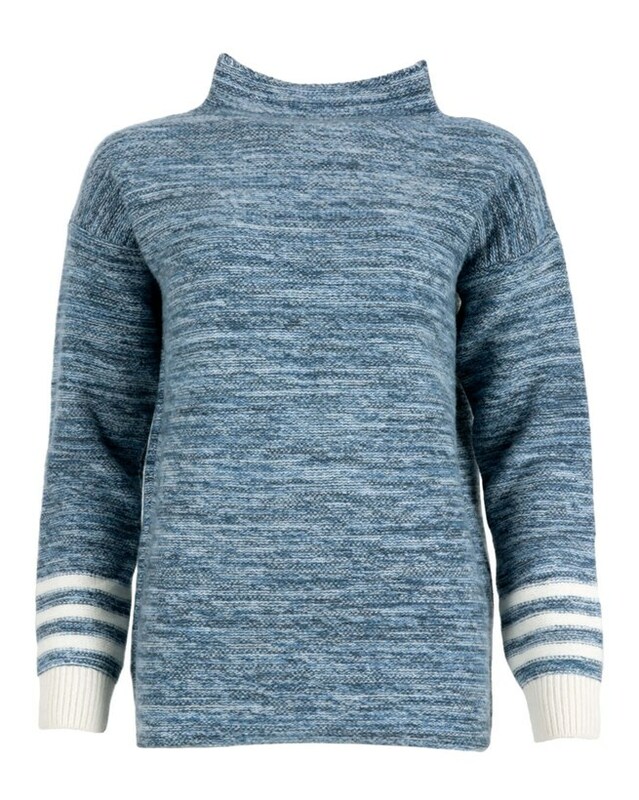 Featuring a funnel neck and cuffed sleeves in a relaxed throw on style, this seasons addition has been crafted from a special yarn twist, creating a unique, ombre pattern in cool, tonal blues. Wonderful products service and all round care.My first order and my first of many I should say. I really love my latest sweater,it’s very soft, Warm,the style is comfortable and it fits me perfectly. Bought a size small.I’m a 10/12 and found this one was true to size. Fitted perfectly.Had some compliments when wearing it toox.Tips on washing it? Thank you for your lovely feedback! 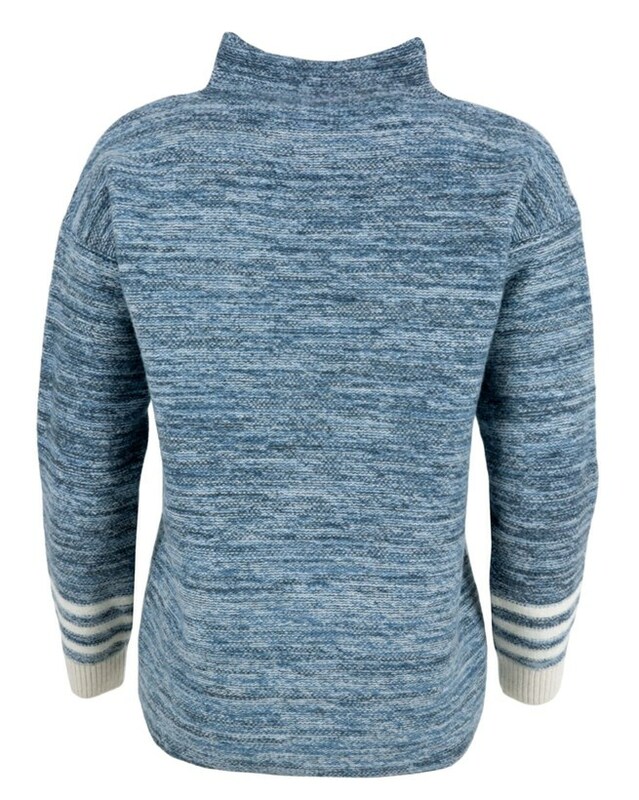 We recommend that this Funnel Neck is hand wasedh only in cold water using Celtic Wool Wash. When washing by hand, avoid twisting or wringing as this may damage the wool. To remove excess water from the garment we recommend wrapping it in a towel and gently squeezing it before leaving the item to dry. Lay the product out flat to dry, do not hang your wool garments.Allow to dry naturally away from all artificial heat sources. Definitely five stars, as always. A beautiful jumper of many blues. Wear with white flares, navy flares, and Celtic clogs, sandals and I adore their flip flops. Four pairs. As for size, excellent. I’m a 16 and this is great with a top. I’d love an XL to be available. I’m a long term steroid user re no immune system and have lost four stone. Great. A trendy jumper that can be worn all year, I’m on the coast, early morning strolls, late evening. I adore all the fabrics. Organic cotton etc. Items which last and stand the test of time. Excellent company. I’ve never returned an item. Face are next, would be a lovely thought. I’d certainly consider. Thank you Celtic. Love this jumper. Great colour and texture. I have ordered two more in different colours. Bust 30" 32" 34" 36" 38" 40" 42" 44"
Waist 23" 25" 27" 29" 31" 32" 34" 36"
Hips 32½" 34½" 36½" 38½" 40½" 42½" 44½" 46½"